A women can never have enough handbags, just like a person that enjoys stitching cards can never have enough patterns!! If you are, then head off to Ann's new homepage and download the new FREE stitching pattern by Ann's Paper Art along with other FREE stitching patterns. This new design is perfect to add a POP of colour using one of the new 3D decoupage sheets with artwork by Moonbeam1212. The new series decoupage sheets with the additional FREE stitching pattern, are available for purchase in craft stores now!! 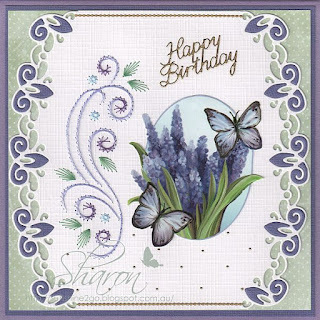 This is the card that I created with the new pattern a741. Threads are Mettler Polysheen 1332, 2550, 2810, 2912, 3045. Marianne Design Craftables CR1332 & CR1354. Sue from Stitch-a Greeting has also stitched 2 cards with the new pattern. 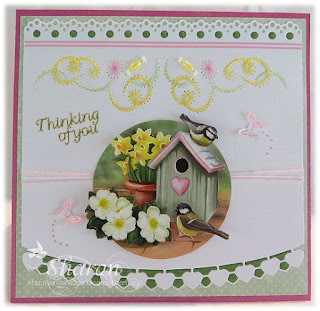 If you haven't tried stitching on card give it a go, it is easy to get hooked on this delightful craft. This month I created my friendship for Frances from New Zealand. The pattern is by Jenine Siemerink and can be found in Hobbyjournaal 87. Threads are Mettler Polysheen 0630, 2155, 5833, 6051. New die by Marianne Design LR0413. Butterfly die CR1354. Decoupage by Amy Design "Spring Garden" CD10607. The die and decoupage are both available from Ann's Paper Art webshop till sold out. Twine and beads have also been added to complete the card. I hope that you all have a lovely week. On Mother's Day our daughter celebrated her birthday. and she is another year older. 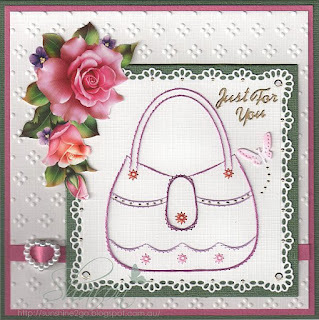 The pattern is by Ann's Paper Art a941 which can also be found in Stitching Sheets 22. Threads are Mettler Polysheen 2905, 3151, 3652, 5531. Along the edges I have used Marianne Design LR0396. 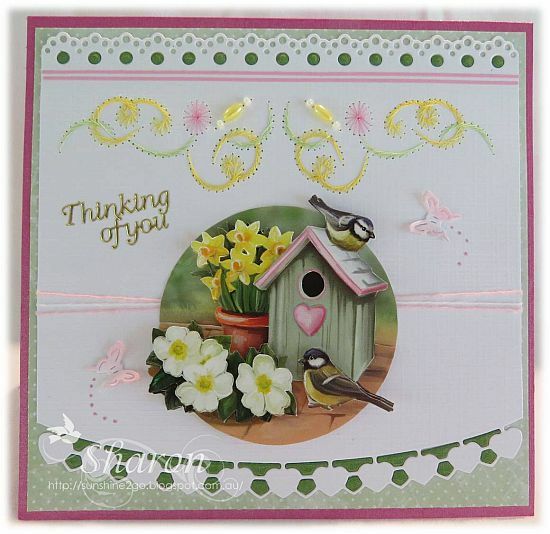 Beautiful decoupage is Amy "Spring Garden" CD10609. Background card is Janneke Brinkman - Salentijn. Stickers and hobbydots have been added.